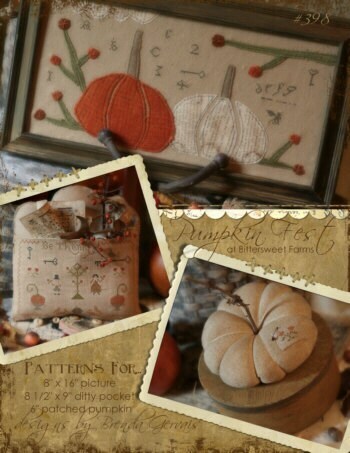 Pumpkin Fest at Bittersweet Farms- Three fun-filled Autumn projects for the price of 2 patterns. Pattern includes instructions for an 8" x 16" wool & paper quick sew applique/cross stitched picture, 8 1/2" x 9" cross stitch ditty pocket to fill with old sheet music, bittersweet and leaves and last but not least...a sweet 6" patched pumpkin. Three fun-filled and fast stitch projects to add charm to your home this Autumn season.